Camilla J. 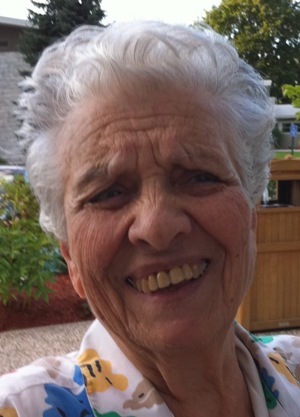 (Carnevale) Makarewicz, 94, of Lowell, died Sunday, April 8th at D’Youville Senior Care Center. She was the beloved wife of the late Chester E. Makarewicz who died January 22, 2012. Born in Lowell, Massachusetts, December 5, 1923, a daughter of the late Joseph and the late Jennie (Baroni) Carnevale, she attended Lowell schools and was a graduate of Lowell High School. Camilla and Chester met while employed at Prince Macaroni where they both worked until he was deployed to the South Pacific Theatre during World War II. They continued to write each other for 3 1/2 years while she was employed as a seamstress making parachutes for the war effort. They married on April 25, 1946 and enjoyed 66 years of bliss. Camilla’s vocation was homemaker until her two sons were of age. For many years she was employed at the Solomon Mental Health Center in Lowell. Among her many interests she enjoyed sewing, reading and was an active communicant of St. Rita’s Church where she was also a choir member. In her latter years, she was a resident at D’Youville Senior Care Center where she was endeared by the staff for her quick wit and many quips. Camilla is survived by a son Carl R. Makarewicz, MD; two grandchildren Barrett and Jenna Makarewicz of NH; two sisters Mary Milot of Dracut and Virginia Sheehan of Lowell; and many nieces and nephews. She was predeceased by her siblings; Grace Dunn of Arizona, Daniel Vale of Londonderry, NH, John Carnevale of Dracut, Rita Foley of Lowell, Joseph Carnevale of Lowell and Carlene Creegan of Lowell. Friends may call at the O’DONNELL FUNERAL HOME 276 PAWTUCKET ST. at Fletcher from 4 to 7 P.M. on Tuesday, April 24th. Relatives and friends are invited to attend her Funeral Mass to be celebrated on Wednesday morning at the PARISH of ST. RITA CHURCH, 158 Mammoth Road in Lowell at 10 o’clock followed by burial in St. Patrick Cemetery. E-condolences at www.odonnellfuneralhome.com. Those wishing may make contributions in her memory to St. Rita’s Church, 158 Mammoth Rd., Lowell, MA 01854. Arrangements by Funeral Director James F. O’Donnell, Jr. (978) 458-8768. Dear Grammy, we are so sorry we never got the chance to say good bye. No one in the family let us know that you had passed away. If we had been notified we would have attended the service. Heaven gained an angel - hope you know that we, your grandchildren, always loved you. So sorry to hear my Aunt Camilla has died but glad she had a long and fruitful life.I havn't seen her in many years.I hope Carl and everyone are doing ok.I just found out a few hours ago and wish there was someway to make the calling hours but my work schedule won't allow it.